According to Sports Talk Florida, guard Carl Nicks is fighting a long term injury with his foot, and will reduce his reps in practice to increase his likelihood of playing in games each week. 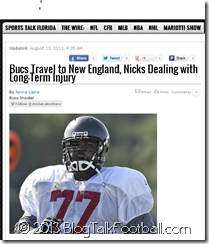 Carl Nicks is expected to get some playing time in the second preseason game on Friday night against the Patriots. General Manager Mark Dominik of the Buccaneers said Darrelle Revis is expected to play in the third preseason game against the Dolphins. This means the rehab for both of these players has reached a point where the players and the trainers are feeling like they will be able to play without hindering their recovery. With the offensive line finally coming together (guard Davin Joseph is not yet participating as he is still recovering from the season ending injury he sustained last year), the coaching staff is excited to see how they will do against the defensive front of the New England Patriots. Coach Schiano envisions Doug Martin having a good practice with a different defense in place. The practices with another team began last year when Coach Schiano invited Coach Belichick of the Patriots to a joint practice session in Tampa Bay before a preseason game against the Buccaneers. This year, Belichick returned the favor, only this year, the Buccaneers will also travel to New England during the regular season in week 3. Roy Cummings from Tampa Bay Online has revealed that the Buccaneers have waived guard Howard Barbieri. According to Rick Stroud, TicketCity.com recently revealed that the Buccaneers have the “least engaged,” fans in the NFL – something that I ranted about on The Monday Morning QB Show yesterday! After being at the games, I can agree!